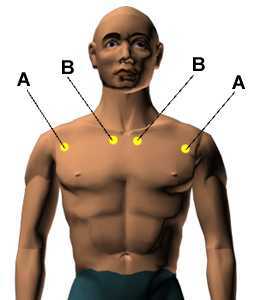 There are the acupressure points for relieving Asthma and Breathing Difficulties.Working on these points can help to relieving Asthma and Breathing Difficulties. You do not have to use all of these points. Location: On the outer part of the chest, three finger widths below the collarbone. Benefits: Relieves asthma, breathing difficulties, chest tension and congestion, coughing, and tension due to emotional distress. Location: In the hollow below the collarbone next to the breastbone. Benefits: Relieves chest congestion, breathing difficulties, asthma, coughing, and anxiety. 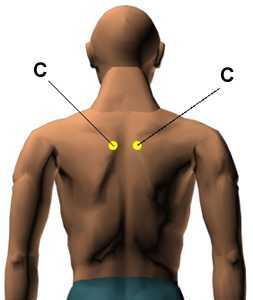 Location: One finger width below the upper tip of the shoulder blade, between the spine and the scapula. Benefits: Relieves asthma, coughing, sneezing, and severe muscle spasms in the shoulders and neck. Location: On the palm side of the hand in the center of the pad at the base of the thumb. Benefits: Relieves shallow breathing, coughing, and swollen throat. Location: In the groove at the wrist fold below the base of the thumb. Benefits: Relieves lung problems, coughing, and asthma.